The Fire was nearly out..so why was it abandoned by bushfire management? The 2009 Wilsons Promontory bushfire was reportedly sparked by lightning striking the remote Cathedral Range on the east coast just north of Sealers Cove on Sunday 8th February 2009. Witnesses say that by the following Friday 13th, the fire was still localised on the Range and all but out. This is confirmed by the following satellite photo taken by NASA’s MODIS Rapid Response Team on the 13th. The satellite takes high-resolution images of visible, shortwave and near-infrared light of Victoria twice daily. 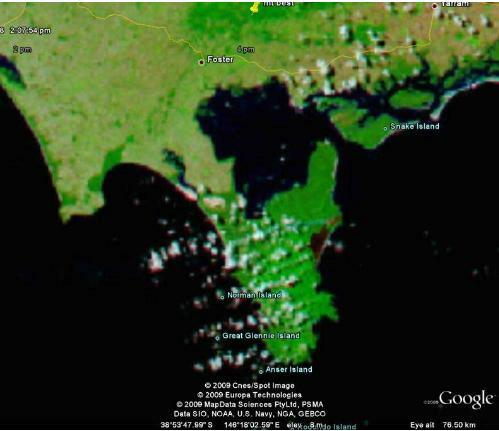 showing scattered cloud over the Prom and on the east coast (right side) a small red (burnt) patch with only a single column of smoke noticeable. Over the subsequent days the fire continued to burn then the winds increased. Now, more than two weeks later most of the northern half of ‘the Prom’ has been burnt. The vegetation has gone. The Victorian Country Fire Authority (CFA) website today reports 23,800 hectares burnt out. 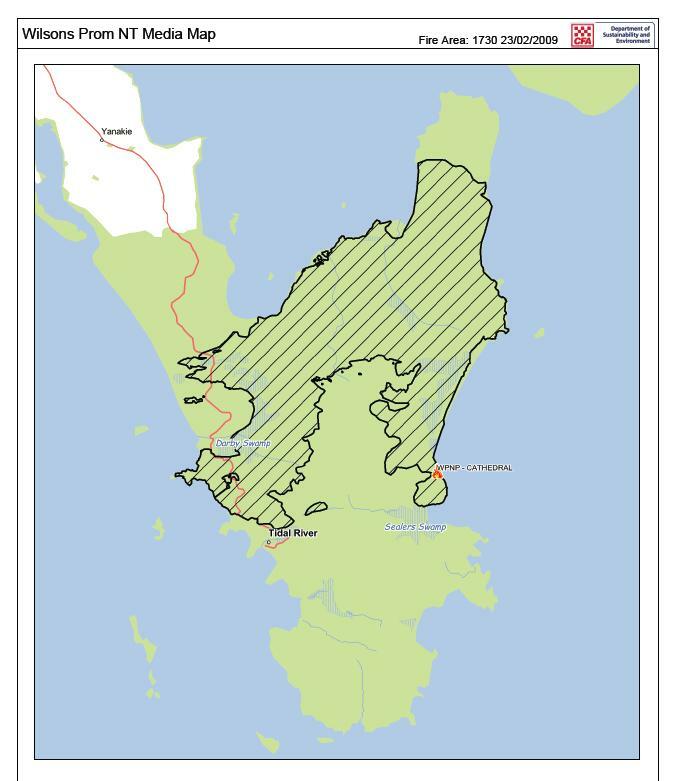 The Department of Sustainability and Environment (DSE) website shows the following map of the burn (shaded area below). The fire has burnt the Cathedral Range, along the east coastline right across and along the Corner Inlet shoreline to Millers Landing. Affected sites are Vereker Creek, Whiskey Bay, Tongue Point, Monkey Point, Three Mile Point, Mt Roundback, Three Mile Beach, Mt Margaret, Lighthouse Point Lighthouse, Mt Hunter and parts of Darby Swamp. Wilsons Promontory National Park is just one of the many important natural and wilderness areas of Victoria devastated by these current bushfires. In the case of the Prom, this is the second time in four years that fire has burnt through this northern region. 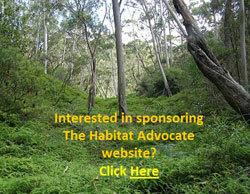 On 21 March 2005, a twenty hectare prescribed burn was lit east of Tidal River. It escaped three times over a period of twelve days and burnt out 6,000 hectares of native bushland in the National Park. A key investigative report was undertaken by Commissioner, Emergency Services, Bruce Esplin, (the Esplin 2005 Report) into a number of fires over previous years. In the case of this DSE prescribed burn in the Prom, the investigations found that the prescribed burn was poorly planned and after ignition, was not patrolled properly. Yet prescribed burning continues each year across Australia, not in the small mosaics, but on a grand scale and with a record of frequently getting out of control. On top of the 6,000 hectares four years ago, just a few days ago we hear of over 23,000 hectares of the Prom has now been burnt. Fires in the Prom also occurred in 2001. The Prom has diverse vegetation communities including warm temperate and cool temperate rainforest, tall open forests, woodlands, heathlands, and swamp and coastal communities. There are rare stands of White Mangrove, being the most southerly stands of mangroves in the world. The Prom is rich its diversity of native mammals with over thirty species having been recorded, many of which are either rare or threatened. These include the Long-nosed Potoroo, Swamp Antechinus, White-footed Dunnart, Broad-toothed Rat, Feather-tailed Glider and Eastern Pygmy-possum. “One of the most significant habitats of the New Holland Mouse also occurs within the park, and a number of species of whale have been sighted in the waters off its coastline.” The Prom also provides habitat to populations of Eastern Grey Kangaroos, koalas, wombats and emus. However, bushfire research across Australia has shown that while some native flora are fire tolerant and/or can recover and in some case thrive in the immediate years following a fire, other species have not adapted and so they become displaced and can die out. (DSE website). While the Victorian Royal Commission is focusing on the fire management measures to protect life and private and public property associated with the 2009 Victorian Bushfires, the impacts on flora and fauna seem to have been overlooked. 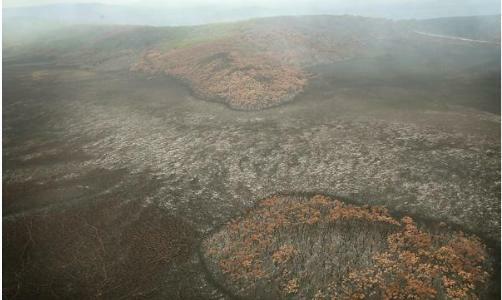 Some species may not survive if fires are too frequent, as the plants are unable to reach maturity and produce sufficient seed before the next fire episode. (DSE website). Little is known about the recovery of fauna diversity as a consequence of such widespread bushfires, be they caused by lightning, intentionally or otherwise. But given the scale of these current fires across the Prom crossing from shore to shore, it is probable than many native animals, as in many other parts of Victoria, will have been burnt alive in the fires and that their already rare populations will now have declined substantially and be at risk of local extinction. In respect to Australia’s fauna, given that there we now have a fraction of the intact native habitat compared with pre-1788, how can anyone argue that allowing bushfires to get out of control is not a threatening process? This entry was posted on Tuesday, July 12th, 2011	and is filed under Threats from Bushfire.